Why might Joseph Smith have made this textual change in 2 Nephi 30? Skousen elaborated that “the editing change to pure may represent a conscious attempt at avoiding what was perceived as a difficult reading (the Nephites were supposed to be light skinned), which therefore explains why the change from white to pure was made here—and only here—in 2 Nephi 30:6.”9 In other words, Joseph Smith may very well have recognized the possible racial undertones in this passage if interpreted that way and ultimately wished to avoid them. While it is certainly possible that this change reflected the racial attitudes of early members of the Church, who assumed many of the views of their 19th century environment,10 Tvedtnes argued convincingly that the change may have occurred to emphasize that the text is speaking of a spiritual, not biological, condition. See the link for the full article. 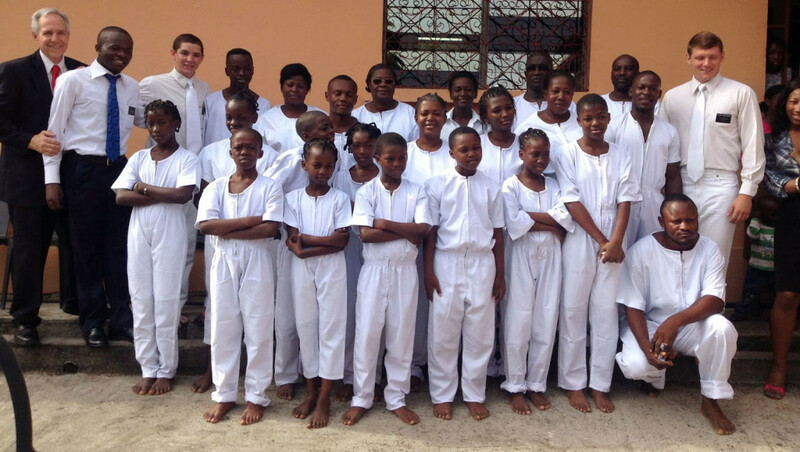 This photo in the article of people dressed in robes for baptisms conveys the spiritual meaning of purity and the visual white of the clothing along with the warmth and vibrancy of faces in different shades of brown. God’s ways are not our ways and his timing is his own. Christ went first to the Jews because they were thoroughly prepared by the scriptures, so meticulously handed down through the ages, to know and recognize Christ, yet they failed because of pride and sin. Christ then taught the gospel to the pure in heart among the Gentiles, who were deemed less than equals by the more learned, prideful Jewish people at the time. As learning gospel doctrine is best learned with milk before meat, I believe all people have to be prepared in some way or another to recognize and fully accept truth today. What we have to remember is to righteously judge people as an individuals, not as complete groups or races. Every man is prideful, sinful and in need of repentance, only Christ was perfect. When slavery was allowed to be the law of the land by the government and wicked people it was wrong and needed to be corrected. All slavery is of the Devil. God’s timing is not our own and I believe there is still much to be done to uphold and protect freedom under natural law, given by God and not man’s law, which can be manipulated and ultimately destroy freedom. Our Constitution is such a powerful document that it holds a great key to the freedom of all men, women and children. The gospel of Christ and the true intent of the Constitution go hand in hand, for the good of all mankind. That ins’ghtis just what I’ve been looking for. Thanks!